“9-Year-Old Humanitarian Selflessly Raises $3k for Indonesia”, “Meet nine-year-old Winter Vincent and be inspired!” and “Nine-year-old surf star Winter Vincent”. Impressive for a Sydney boy who is still in primary school (He is pictured above with village elders in the Mentawai Islands in Indonesia). But, he’s not alone. Winter is part of a growing number of children who are carefully carving out a personal brand via social media, with the help of their savvy parents. Personal branding guru Jon Michail says your name is your biggest asset when seeking employment. “Google runs the world now,” says Michail, CEO of Image Group International, who has helped politicians and sports stars create a public profile. “This is the new landscape in which we are all competing. Jon Michail, 54, says the CV is practically dead and if tomorrow’s employees want to make a mark they will need to have their own website, preferably a .com, a social media strategy and a strong personal brand. Digital strategist Natalie Alaimo is due to give birth to her first baby in May. On her to-do list after her son arrives is to buy his domain name. She has already bought the domain names of her mother, father, brother and sister so they can create their own personal websites in the future if they wish to and to prevent anyone else snapping them up. “It’s important to protect your own name and as parents you can do that for your child by buying their domain name,” says Alaimo, 33, who runs her business via her domain name, nataliealaimo.com. “In the future employers will just search Google to find out more information about you and you will need to have a presence. 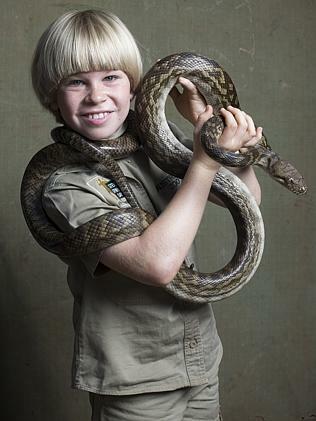 Robert Irwin is following in his father’s footsteps while Indy Clinton is a teenage Instagram star. GoDaddy, a website which sells domain names, says “registering a domain name is probably one of the safest, cheapest and most effective ways of securing your child’s online identity early in their lives”. “A domain name and website bought with a child’s name can one day serve as the ‘centre of gravity’ for their child’s YouTube, Facebook, and whatever other social sites they may choose to be active on,” says a GoDaddy spokesman. Meanwhile, Winter’s mum Melanie Koeman, 43, says she did not plan to create a personal brand for her son, it happened almost by accident. She opened social media accounts for Winter when he was seven in order to post photos and keep his surfing sponsors happy. “We realised his future may not be a conventional one and building up his ‘CV’ might open up avenues for him,” she says. Now 10, Winter has his own parent-operated Instagram, Facebook and Vimeo sites that promote his surfing achievements and his role as a charity ambassador for Waves For Water, of which he has his own offshoot Winter4Water, and his own logo. Last year he encouraged his school friends to raise thousands of dollars for water filtration kits which helped provide clean water for up to 5000 inhabitants on the Mentawai Islands, Indonesia. Last month he was back in Indonesia promoting his charity work. “His sponsors are happy not only with Winter’s surfing, but they are equally happy with Winter as a person — his pursuits outside of his chosen sport, his positive attitude, etc — all this is conveyed on social media,” says Koeman, who lives on the northern beaches. She says his accounts are operated by her, but in the future, when Winter takes control of his own social media, he will have a good sense of how a positive approach can help him. Winter Vincent and former world champion Barton Lynch after a session at North Steyne. “So far it is apparent that the opportunity to spread ‘good vibes’ and inspiration via social media is enormous,” says Koeman. “Winter gave a speech in a Jakarta school last month on his Winter4Water work. Afterwards, kids his age were taking selfies of him, following him on Instagram and pledging to get involved. Michail says Winter is a superstar in the making. “Winter Vincent is really cool. He has a talent, but is also involved in philanthropic work,” says Michail. “He has the whole Aussie look and he has an amazing name that really stands out. 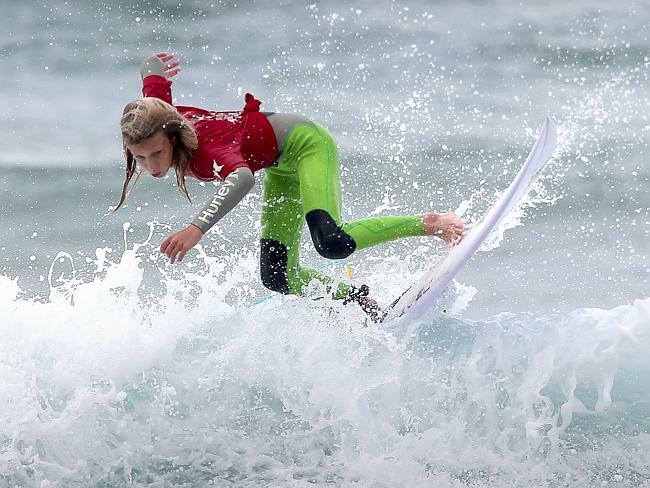 Winter Vincent cuts loose in the under-10s final of Barton Lynch’s Blast Off event at Whale Beach. But before we all rush to our computers in a panic to start creating a personal brand for our children, Michail says most kids don’t need to think about personal branding until they are nearing the end of schooling, although they should have a LinkedIn account from about the age of 15 years. Alaimo agrees, adding the best thing children can do for their future employment prospects is be mindful of what they post on social media and to keep their settings private. While she knows the importance of owning a personal website, Alaimo says she won’t be obsessively checking domain name sites to see whether her baby’s name is available before announcing it, as there’s always a way round it by adding a middle initial if need be. “It’s hard enough choosing a name both parents are happy with, let alone cross-checking to see whether the domain name is available to buy,” she laughs. © 2015 The Daily Telegraph | This article first appeared on The Daily Telegraph on 18 April 2015.